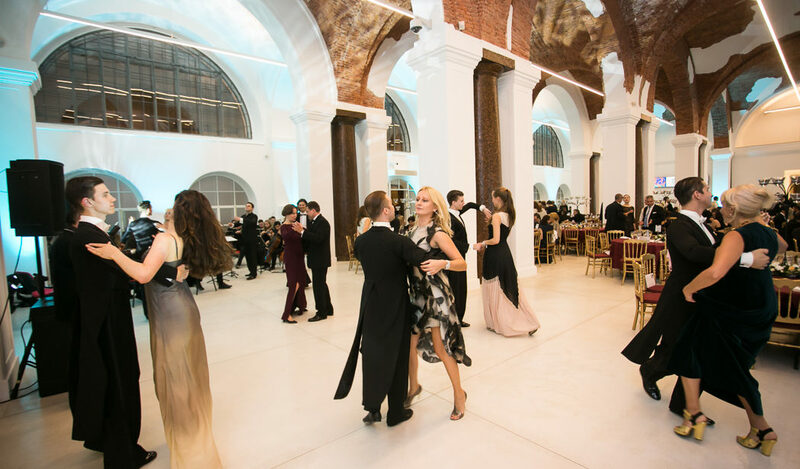 On 26 June 2015 the 10th Gala Charitable Banquet took place in the Winter Palace — Diaghilev. P.S. On 26 June 2015 Festival “Diaghilev P.S.” together with the State Hermitage Museum hold the 10th Gala Charitable Banque in the Winter Palace. All donations will go to the Russian Special Endowment for the Development of the State Hermitage Museum. The guests entered through the famous portico with Atlantes of New Hermitage Building and went up the Nikolaevsky staircase to the Gallery of Ancient Art for a welcome drink. They then walked to the Hermitage theatre where the General Director of the State Hermitage Museum, Mikhail Piotrovskiy, welcomed the guests. He awarded diamond badges of honor with title “Artist at the Hermitage” to the special guests of the Gala – the distinguished architect and first woman to win the Pritzker Prize – Zaha Hadid, and one of classics of contemporary photography, Candida Höfer. The work of both artists is currently on show in the halls of the Hermitage. The performance of soloists of opera and ballet in the Hermitage theatre, as well as the programme of the Banquet as a whole, was dedicated to the dialogue between classic and contemporary art. After a symbolic opening with an overture titled “Musical Journey: from Beethoven to the Present Day”, the concert continued with arias from classical operas, Bizet’s “Carmen” and Donizetti’s “Lucia di Lammermoor”, the pas de deux from the “Carmen Suite” by Shchedrin, “The Dying Swan” by Saint-Saens. The performers were the leading soloists of the Mariinsky Theatre with an added dance routine by the best Russian breakdance group, “Top 9”. This year’s Gala dinner was served in the “Pergamon Hall” – a new space created out of the former stables of Catherine the Great’s Small Hermitage. The architect responsible for the restoration project was the world-renowned architect Rem Koolhaas. After the banquet came the ball and the “most graceful dancer” was awarded a diamond badge. During the evening guests were able to tour the permanent and temporary exhibitions of the museum and visit the exhibition “Zaha Hadid in the Hermitage”, presented in the Nicholaevsky Hall of the Winter Palace. A traditional cocktail “For-the Road” concluded the Gala Dinner in the “Shuvalovsky Proezd” (lane) – another new area of the Hermitage, a passage from Palace Square to the Neva River. Among the honored guests of the Gala Banquet were the artists Zaha Hadid and Candida Höfer, Prince Dmitry Romanov and his wife, Alexander Sokurov, Lev Dodin, president of Phillips Auction House Edward Dolman, Maxim Galkin, Artistic Director of the Fondation Louis Vuitton Suzanne Pagé, Jim Broadbent and heads of the companies who supported the Gala: Gazprombank, LSR, Montblanc, Socio-cultural Hennessy Foundation, Blavatnik Family Foundation, Smolensk Diamonds and others.